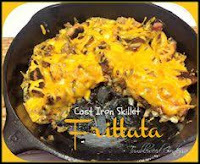 Coat a large broiler-proof skillet with the oil and preheat over medium-high heat. (I recommend an iron skillet but that is just personal choice.) Add the bell peppers, ham, parsley, black pepper and saute for several minutes until the vegetables are crisp tender. Spread the mixture evenly over the bottom of the skillet. Pour the egg substitute over all and reduce the heat to medium-low. Cover and cook without stirring for 6 minutes until the egg is almost set ie edges are cooked top is still runny. Remove skillet (wrap handle in foil if necessary to protect in broiler) and place under a preheated broiler and boil for a couple of minutes until the eggs are set but not dry. Sprinkle with the cheese and broil for another minute to melt the cheese. Remove from broiler and cut into 4 wedges. Serve immediately while hot. Note: Not this recipe. Photo used for reference only.